This post goes over some of our findings in improving performance of one of our Apache Camel based web services. The past year, Ticketmaster has seen tremendous growth in our new product, TM+, of which our service is a key component. With the increase in traffic, we have been working hard to ensure acceptable response times for our customer-facing services. For the most part, our service has performed well, with a majority of requests completing within our desired duration. However, we had occasional requests which took longer to execute, at seemingly random intervals, so we set about to investigate and fix these worst-case performance spikes. CSI (Consolidated System of Inventory) is one of our central web services that acts as an abstraction layer for transactional APIs across a potentially wide range of inventory sources. We use Apache Camel – for its excellent support of Enterprise Integration Patterns – to route requests to other web services. Through this investigation, we found several optimizations to the way we use Camel that have greatly reduced garbage collection times, and as a result, improved performance. 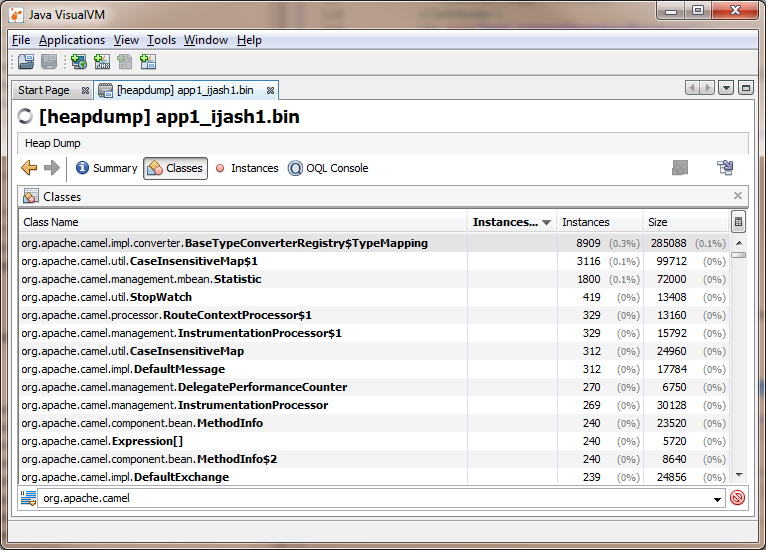 Note that the issues and solutions presented here were discovered using Camel 2.9.2. Another thing to note is that the custom graphs you’re seeing here are all based on Ticketmaster’s awesome open source graphing solution, Metrilyx, which is a visualization layer on top of OpenTSDB. 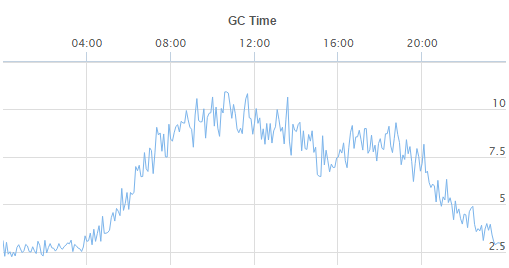 We turned on garbage collection logs and confirmed that collection times directly correlated with the pauses we were seeing in the application. Our problem identified, the next step was to find out how and why our application was allocating excessive amounts of memory. We had had success using Java’s VisualVM to diagnose previous memory issues, so we began by using that tool to inspect heap dumps. Although the excessive garbage collection times are a result of memory usage, the issue is not a memory leak, so the problem objects are not immediately apparent in a heap dump. We were already suspicious of our Camel integration when looking at GC issues, so we drilled down to Camel objects in a heap dump to look for clues. The heap dump was taken while we were putting load on our service, so although the heap dump process temporarily stops the application and triggers a full garbage collection before retrieving the memory snapshot, there were enough in-flight requests to reveal Camel’s TypeMapping class as a possible offender. Objects of this class are very small, but they are allocated at a high rate compared to the overall rate of requests, so we then began to examine what causes these objects to be created. However, this flexibility comes at a cost of high and rapid memory allocation. Every time Camel tries to perform a conversion, it checks to see if it has attempted it before, by creating a TypeMapping object that encapsulates the relationship between the source and destination types, which is then used as a key for Camel’s in-memory map of Type Converters. Over the course of a single request, we observed hundreds of these objects being created. Increasing the severity of the issue is the fact that Camel uses this conversion strategy for more than just the exchange payload. Camel attempts to convert method invocations in routes to its native Processor interface before proceeding with the invocation. Due to the nature of this issue, fixes are necessarily on a case-by-case basis. We combed through our Camel routes to find places where we could help Camel eliminate the need to perform these type conversions. The important point of this fix is that we are requesting the exchange body as its actual type (MessageContentsList). When this is done, the method call is virtually free, and no TypeMapping objects are created. Because of Camel’s flexibility, this change is transparent to other places in our code where we extract the message body, but all of those calls are now optimized as well, assuming the requested type is the same as the actual body type. Since CSI is a routing service that makes calls to other systems, we invoke this processor both when we receive the incoming request from the client and the incoming response from the end inventory system. With this invocation, Camel calls the method directly without trying to convert the bean to a processor. With these fixes deployed, impact to our GC time was immediate and significant. 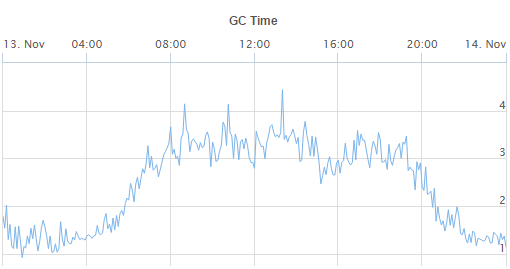 Peak GC times went down by around two-thirds. Due to the random nature of GC-related performance issues, and usage patterns of the CSI service, direct performance impacts can be difficult to measure. However, we have seen that worst-case execution time is generally much lower and more stable. When you encountered these issues did you attempt to increase your JVM’s NewSize to meet the new object generation rate required by your application? I have run into similar performance issues in the past and was able to overcome them by making sure that my JVM Young Generation (Eden, and Survior) space was properly sized for my applications needs to avoid unnecessary minor and major garbage collections. I have no doubt the changes you made will yield better performance, but just wanted to know if there was a way to overcome this performance hump and still be able to rely on camel’s Type Converter API when needed and not have to worry about the performance hit. We didn’t spend much time turning GC knobs when we started looking at the issue, because we wanted to focus on finding ways to reduce memory usage within the application. With regards to the TypeConverter API, our use case is straightforward enough so that altering our routes to force the most optimal usage of the converters was a practical approach to dealing with the issue. So for more complex routes where these kinds of changes may not be feasible, I don’t have a definitive answer as to whether similar improvements can be made by adjusting JVM settings alone. But it is possible–since the objects created by the TypeConverter are very short-lived, the pauses incurred by promoting objects to the survivor space were probably for other objects in the application, prematurely pushed out of the Eden space by the volume of Camel objects. In that case, increasing the Eden space could help by delaying garbage collection enough to let other objects die (this is effectively what happened when we implemented our fixes). We will consider this in further efforts, and it is very helpful to know you had success in tuning those settings! I hope this helps, and thanks! Well if you do ever end up getting around to tinkering with the JVM settings for this please do share your findings as I am indeed curious. I believe we just had a similar problem. We are using Camel for some Extract Transform Load tasks: pulling data out of some databases, mashing the results into new forms, and putting them into another database. We are using inline Groovy in several places because of its concise syntax and general ease of use. Unfortunately, we found that after running several hours we were getting out of memory errors. I plugged in VisualVM and could see that the number of classes loaded kept going up, and each time garbage collection happened about 15MB of heap memory got lost. Not good. To troubleshoot, I pulled all the Groovy to an external library. Just doing this slowed down the memory leak, but did not stop it. Then I applied the @CompileStatic annotation to my Groovy class. This, of course, caused all the dynamic duck typing to break horribly. Bye-bye “def”, using dot-notation on maps, and a several other conveniences. But, the memory leak went away. The number of classes loaded stabilized, GC stopped leaking heap memory. It is very clear Camel did not clean up after itself cleanly after each run through the route.